If you are dealing with the piping, you may often face the situation when it is needed to estimate the volume of a pipe. There are various options existing for you. You may solve this problem by the application of the corresponding formula. It fits the best if you are skilled professional and know how to use it correctly. Or you can follow the most convenient and reliable way a relevant online application. Here is a valuable and extra helpful one of them, which can be used for the estimations of the volume, capacity, or outer area of the pipes, tubes and similar bodies. All you need is just to insert relevant size to the boxes. After the estimation has been made, you will get the values of the pipeline total volume, volume per a running metre, and the area of the pipe surface. The first function of an online app is the pipe volume calculator. Estimation of the pipe volume is a classical problem in the field of the applied science and engineering. This task seems to be nontrivial. If you use analytical formulas to estimate the liquid volume in different tanks and reservoirs or other physical bodies, it could be complicated and tedious. Nevertheless, to calculate the volume of elemental bodies could be simpler. For instance, just several mathematical formulas will assist you in calculation of the pipeline volume. The standard measurement unit of the liquid volume in the pipes is m³. But our online application gives results in litres, except the calculation of the pipe area, which is given in m². 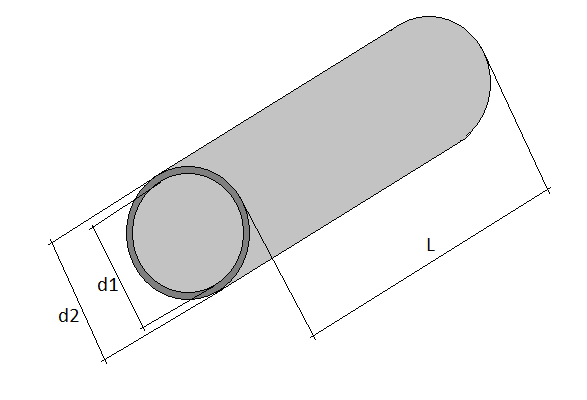 When calculating, it is necessary to indicate the inner diameter, outer diameter of the tube, and its length. The calculation of the tube volume is done by the formula V=π*R1^2*L.
Second, it can be used as the pipe capacity calculator. This function will support you in the estimation when you select the pipes for the gas or water supply needs. The pipe capacity is a metric volume. It shows the maximum amount of flow you can run through the system, e.g. heating system, per certain period of time. If you use the plastic pipes, the pipe capacity is constant and will no change in time because plastic resists inside corrosion. The opposite situation can occur in the case, when the metal pipes are used. It is important to know the maintenance specification of the assembled elements used when the plumbing equipment is connected. This will assure the water supply stays stable when you open the tap in the bathroom. It is a crucial issue for the piping of the heating system, as the hot water used even speeds up the corrosion occurrence process. You should take a note that a length of the piping influences the pipe capacity. And the last use of this free software is the pipe area calculator. To know the pipe surface is required when estimating the volume of the paintwork materials required. The pipe area is calculated by the following formula P=2*π*R2*L.